There are few things that can make a room cozier than a fireplace, especially in the winter season. Many people appreciate the benefits of fireplaces, but they don’t like how they tend to have a large impact on the room’s design. This is what started the trend of minimalist fireplaces. You can have the cozy vibes while seamlessly integrating the fireplace in a modern room. The fireplace is a functional element for a room, but you can get inspired from some ingenious designs to make it fit into your personal vision. 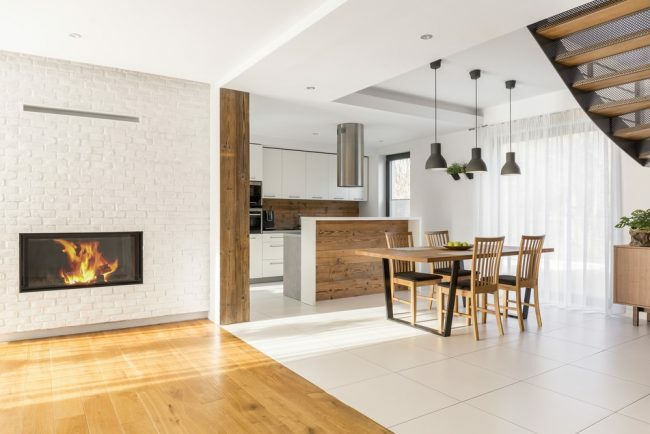 We’ll take a look at some of these fireplaces which can work wonders for homeowners that prefer a minimalist look. These will not only keep you warm and cozy, but they will also help you redefine the aesthetics of your living space. One of our favorite fireplaces to try is the glass-encased model. The glass cutout helps to maintain the fireplace as an interesting element in the room which seems to elevate the entire look. A minimalist color palette seems to work very well with this type of fireplace as the glass lets the vibrancy of the fire shine more spectacularly. When it comes to making a bolder statement, you should consider the idea of a corner fireplace. It’s definitely more interesting to be able to check out the fire from more angles. This type of minimalist fireplace can add some depth to the room while creating a sense of incompleteness. Corner fireplaces have the ability to stray from the usual design path of symmetry and they also allow you to place the fireplace in a more unconventional location. The fireplace doesn’t necessarily have to be the central element of the room. In this example, it seems to match very well the look of the sectional sofa with boho accessories. The fireplace has a minimal impact on the design of the room as it just offers some welcomed warmth. Having a fireplace in the bedroom might seem unusual to try as it can take your mind to a complete makeover of the room to suit its imposing design. 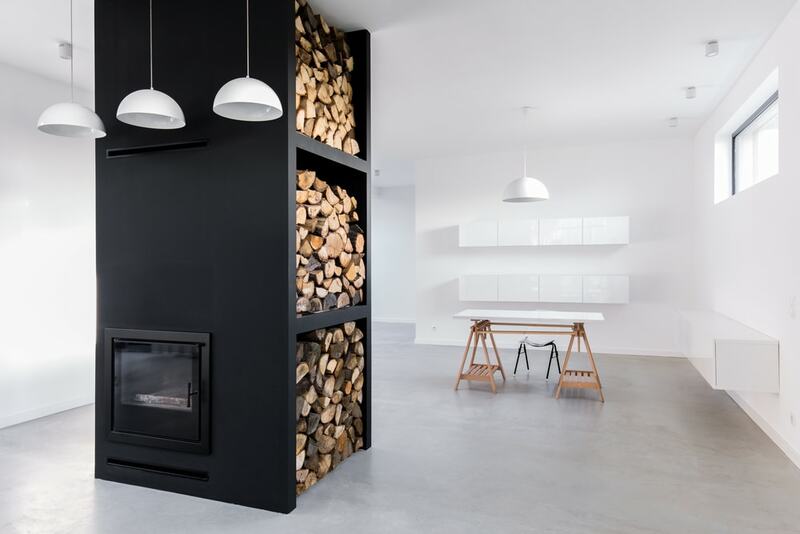 This is where a more minimalist fireplace can come in handy. It boosts the coziness of this relaxing environment without affecting the visual balance. Minimalist fireplaces come with lots of different designs and they’re usually suited for modern-inspired décor. 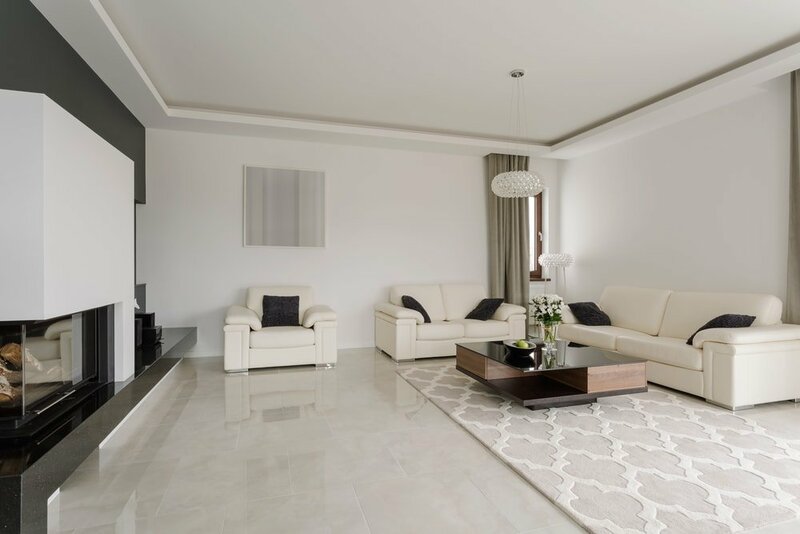 A black and white color scheme is often part of a minimalist interior design style. You can also incorporate a fireplace to create a more delightfully warm ambiance in the living room. 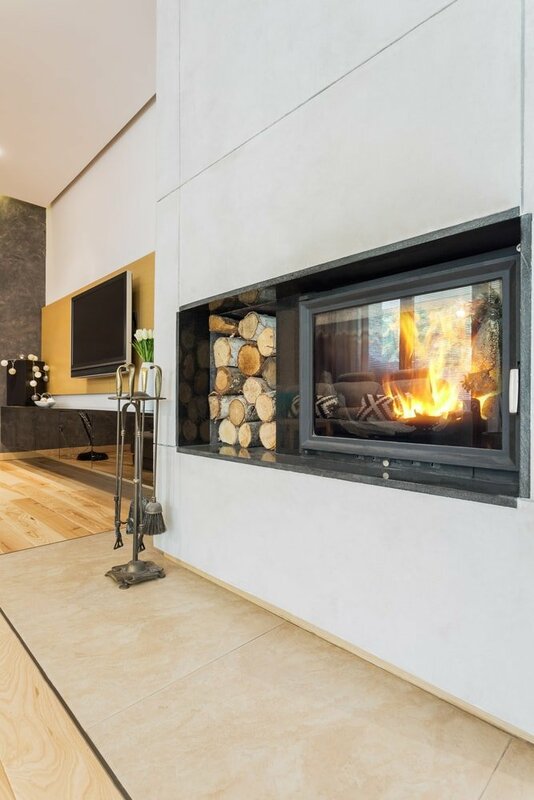 Keeping the fireplace dark will offer great contrast for the fire while combining it with the white from the surrounding structures means you’ll obtain a harmonious and minimalist look. A stylish white expanse helps to make your fireplace more captivating to the eye. 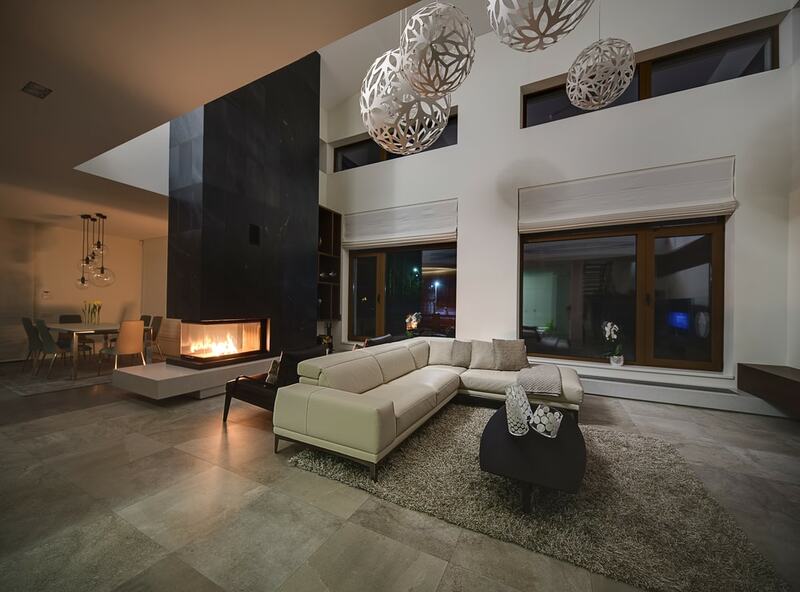 Those who like their minimalist fireplaces to be sleek will appreciate this design approach. It transforms a white wall or empty space with a beautiful warm character that breathes new life into any room. Here’s a more unique idea if you’re into minimalist fireplaces that can cover multiple purposes. This fireplace also serves as a room divider which can be useful if you wish to dedicate a part of a large room to create a cozy dining area. Having the fireplace as a separator brings more visual interest as opposed to using a conventional room divider. Minimalist fireplaces don’t necessarily have to be flat and encased in the wall. 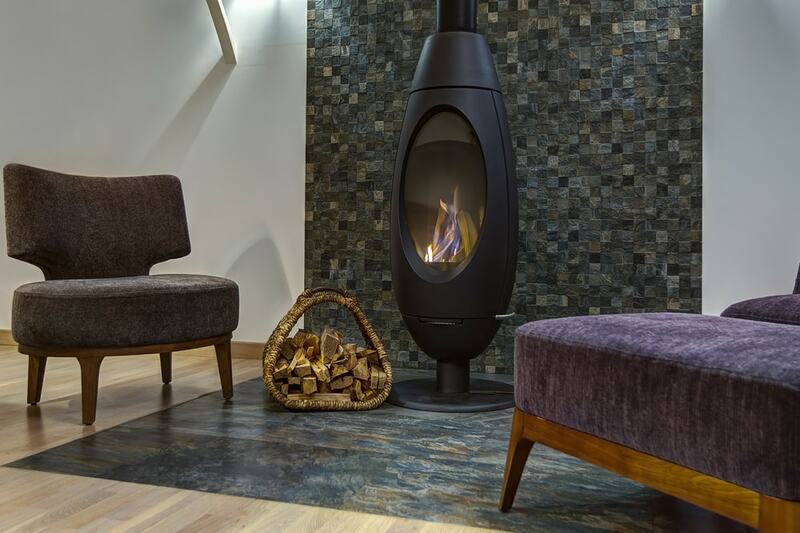 You can go for a different route and opt for a free-standing fireplace that has some elegant curves and the kind of look that belongs in a minimalist environment. It’s austere yet charming at the same time. As a bonus, it’s often much easier to install compared to the usual fireplaces. 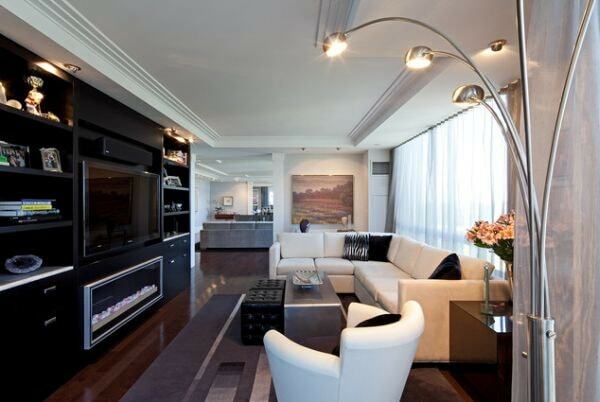 Minimalist rooms can look very stylish if you add a fireplace that’s designed in the same way. To prevent the overall look from becoming too cold and monotone, you can include some rustic vibes. 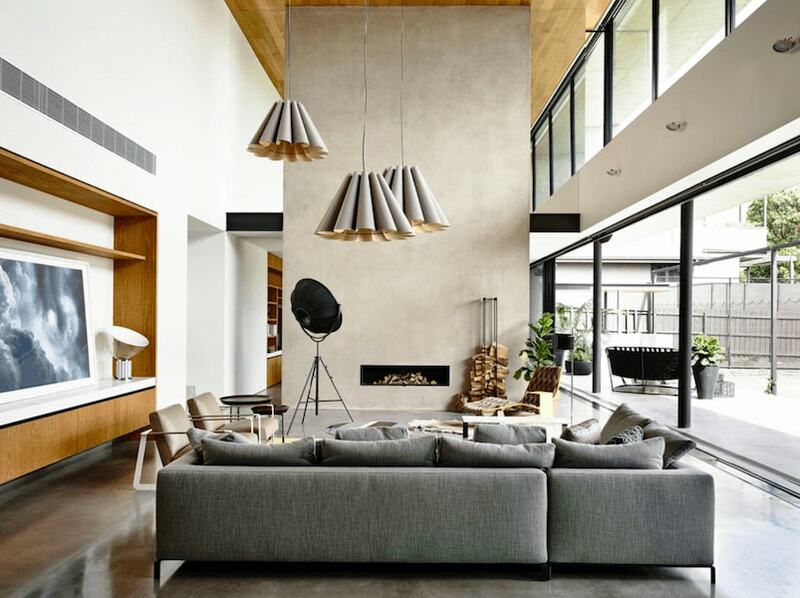 Having a convenient storage space for wood represents a fine example as it contrasts with the modern lines of the room bringing in some warmth to the area. Showcasing a minimalist fireplace in a more unique way can be done with the help of a giant expanse of concrete. This fireplace comes encased in the creamy-toned concrete offering a touch of elegant modernity to the area. If you are really into creating a fireplace as minimalist as possible, this is a very effective way to go about it. Those who like the idea of integrating some modern industrial elements into their rooms will probably love this hanging orb fireplace. It’s the perfect addition for a tall ceiling as it’s designed to enhance the sense of space in the room. This is one creative solution for a minimalist fireplace. One of the best ways to keep the visual impact of a fireplace to a minimum is to place it along with other elements. 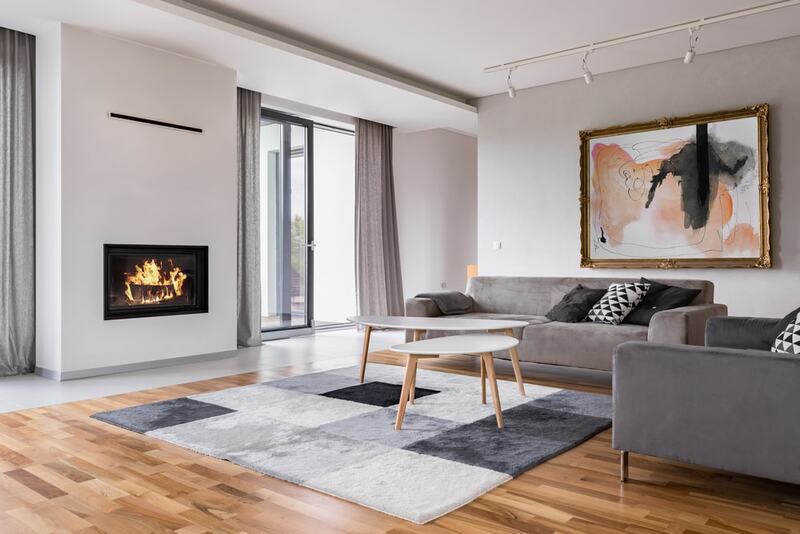 By integrating it into furniture elements, the fireplace turns from a central focal point to just another component of the room that contributes to the atmosphere. People might even fail to notice it at first as the fireplace seems so perfectly disguised so as to not draw unnecessary attention. As we’ve seen so far, minimalist fireplaces come in many shapes and sizes. 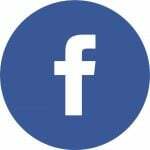 If you like the concept, but many of these ideas seem to minimalist for your tastes, it’s good to know that you can always find options that strike a good visual balance. 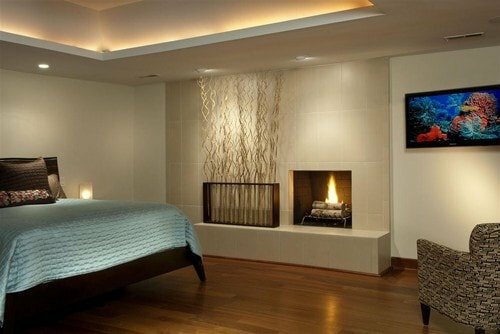 Places like the bedroom can usually use fireplaces that show off more interesting designs. 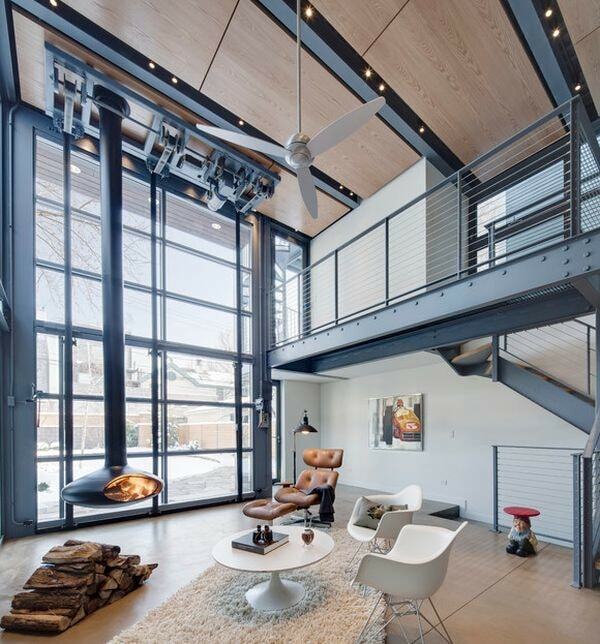 Meanwhile, other places, such as the living room, would be better suited to stick to a strong minimalist theme.